Like so many of us, I use a lot of fabric, and consequently end up with a lot of scraps. I used to try to be good about using them, but lately I’ve just been dumping them all into a huge plastic storage tub and ignoring them. Well, when I no longer could close that tub, and when Max found it fun to go diving into said tub, I decided it might be time to work on a couple scrap quilts. 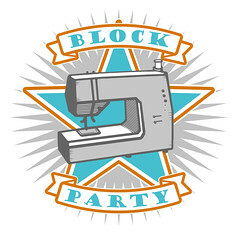 I had plans for a plus quilt using scraps, though it looked nothing like this one. Then I made up my section for Monica’s traveling quilt, and loved the look of those little rainbow plusses and knew I just had to make up a mini for myself. And can I just tell you how fun it is to see all those little scraps put to use? So much better than stuffed into a bin! I used up the remaining rainbow squares for a backing, and I like it equally as much as the front. For a minute I considered making it a separate quilt, but I think instead this will just be a lovely reversible rainbow mini. But how to quilt it? I keep thinking about it, but honestly I have no idea. You? This entry was posted in baby, Fabric, Posts about Quilts and tagged baby quilt, Fabric, handmade, patchwork, plus quilt, quilt, rainbow, scrap fabric, scraps. Bookmark the permalink. I’m loving wavy quilting with my walking foot right now– so fun and easy! 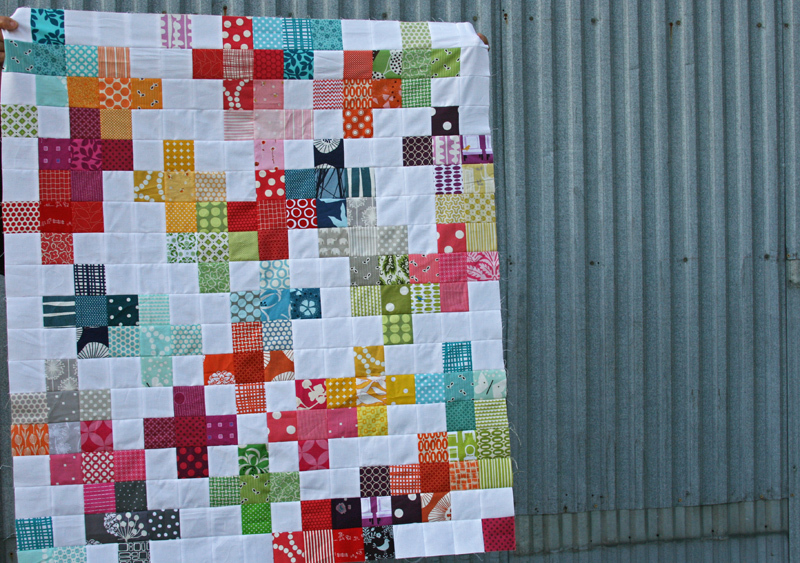 This is SUCH a great quilt pattern for scraps! My scrap bins are currently overflowing, and I’ve definitely been looking for ways to alleviate the problem. Your quilt top looks great! it is gorgeous! 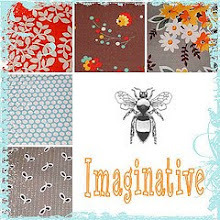 I have been planning a scrap quilt and this is so perfect! What a great use of your scraps. Definitely putting this in my scrap inspiration folder! As for the quilting, I think a bunch of straight lines at all different angles so that there is no “pattern” to the quilting could work really well. Good luck deciding and thanks always for sharing and blogging! really cute- rainbows are always fun. I have a plus quilt all cut out ready to start the layout. I think you could quilt with big doodle like loops (a cursive E), in vertical columns. Maybe a plethora of cross hatches, for quilting? I really want to make a plus quilt but get easily frustrated when laying out my design so don’t know if I have the patience for it! Love the quilt top and back, great use of scraps. Both designs are very linear, how about circles or swirls, for fun. Love this design Ashley! Did you just wing it or use a certain method or pattern? Awesome!!! Love this! What size squares were they cut or finished for the top? Laughing that this is your definition of a “mini” quilt. Looks pretty big for a mini! 🙂 I’d vote for straight, random lines or diagonals crossing through the crosses. Looks great! 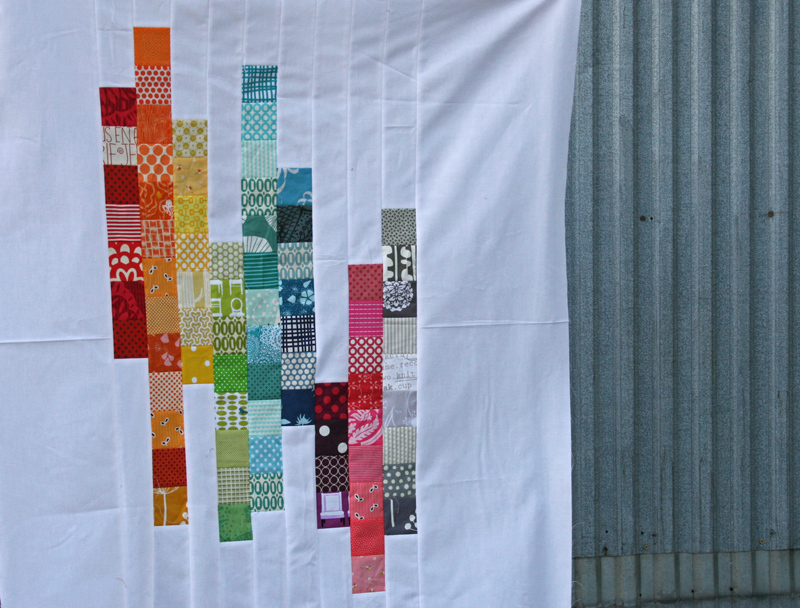 Super duper rainbow scraps quilt. So elegantly done. I also think you should keep the strips as the back for a great reversible quilt. As far as quilting – I like the idea of something free and liberating to contrast the perfectly pieced pluses. Not exactly sure what would fit that though. Gorgeous! I would love to make one of these! love this idea for scraps! I like the random plusses (is that the plural?). Why don’t you give scraps away (like selling them or a giveaway) to those who don’t have so many scraps? Just an idea. At first glance I thought “Great, just make one colour plus signs. How easy.” Further thoughts proved how wrong I was. Is it made row by row? That takes a lot of planning. Well done. 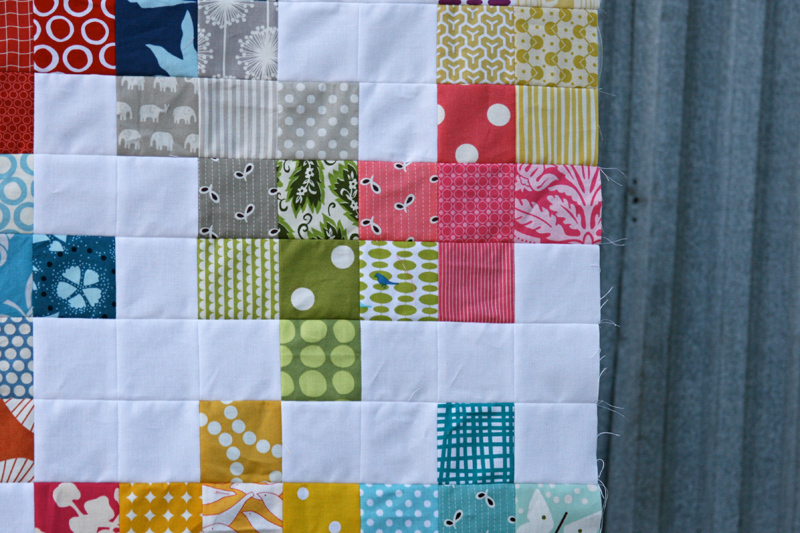 I’m going to use my leftover scraps from our latest quilt group exchange of rainbow blocks and make one. Thanks for the idea. Love this quilt, and I’ve got to say I might even use that back for a front, it’s very cool! I love this scrap quilt and this is one of a kind! Great job..
Push on the “Like”-button !! Ooh, pretty! Maybe go with the rainbow theme and quilt the names of colors? except they’d be backwards on the reverse side, so you could alternate which side you quilt on so that half are normal and half are mirror-writing on each side? It would help reinforce that it’s truly reversible, not a “front” and a “back”? I like the idea of circles to complement all the squares. Like the top of an old table where no one used coasters under their drinks. See now I’ve still never made a plus quilt. This one is calling me! Like you said, I love the back as much as the front. Deciding on a quilting design is always a struggle for me. This turned out gorgeous! I need to do something with my scraps. They’re literally taking over my studio. 🙂 I’m thinking some irregularly spaced straight lines, with some random design between some of the lines. I just wanted to say I love your quilts, you have a really good eye for color. I just found your blog and your echino patchwork quilts inspired me to start quilting, so thank for the inspiration!